The display will be 6.1-inches with a resolution of 3120 x 1440. That works out to an unusual ratio of 19.5:9, which is even taller than Samsung's displays. A brightness around 1,000 nits would put the G7 on the same level as modern OLED panels, making the phone more usable in the great outdoors. This appears to be LG Display's M+ technology, which makes use of an RGBW matrix (instead of just RGB) to boost brightness and efficiency. LG says this panel will be 30% more efficient than last year's. The G7's LCD will cover all of the DCI-P3 color space, and you'll be able to choose between multiple display modes. You can see those in the screenshots above, and the image also shows how the notch can be "hidden" on the G7 ThinQ. Although, hiding the notch on an LCD will probably look a bit weird without the perfect black levels of OLED. It is a bit strange for LG to go back to LCD after finally rolling out new OLEDs last year. That will make it harder to minimize bezels, but the company claims the chin on the G7 ThinQ will be only half as large as it was on the G6. That's something, at least. LG's upcoming premium smartphone, the LG G7 ThinQ, will be equipped with a brand new 6.1-inch display QHD+ (3120 x 1440 resolution) FullVision display that is rated at a maximum of 1,000 nit, making it the brightest and most vibrant display on the smartphone market today. Powered by LG's latest LCD technology Super Bright Display, the LG G7 ThinQ allows users the convenience of operating the phone in almost any lighting condition, notably under bright sunlight while reducing power consumption by as much as 30 percent than the LG G6. Building on the well-received LG G6's display-to-body ratio, the LG G7 ThinQ will be easy and comfortable to operate and hold in one hand, especially with the ergonomic and beautiful curved tempered glass. The previous 18:9 FullVision display of the LG G6 has also been enhanced on the LG G7 ThinQ with a new 19.5:9 FullVision screen ratio complemented by almost 50 percent slimmer bottom bezel than its predecessor. Color tones on the LG G7 ThinQ will look rich and natural even under bright light courtesy of the newly developed Super Bright Display by LG that covers 100 percent of DCI-P3 color space. 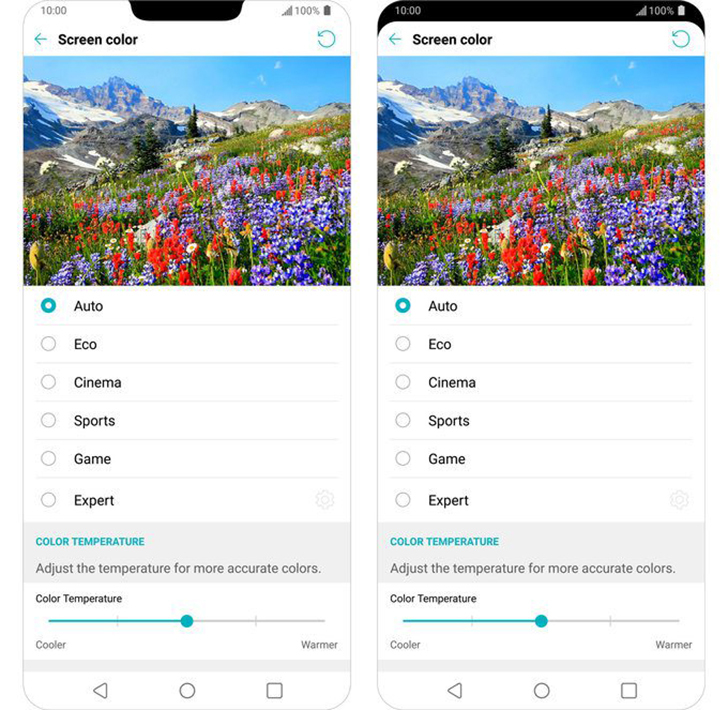 Additionally, the LG G7 ThinQ can automatically adapt to six screen color settings for different content such as Auto, Eco, Cinema, Sports, Game and Expert. Auto mode enables LG G7 ThinQ to automatically analyze current content, such as video, game, photo or web, and optimize display setting while reducing power consumption. For power users that are looking for total control over their smartphone's display, the LG G7 ThinQ allows users to fine-tune the screen by conveniently scrolling each RGB color level option while supporting modes are activated. LG has offered a similar feature with its camera in the past for shutterbugs, and it is doing the same for users desiring a higher-level degree of control with their displays.